The first thing I do when I first walk onto an estuarine flat is to take 10 – 15 minutes to look around through my polaroid’s and see what is happening. I’m looking for two things, fish movement and bird activity, and while I’m looking I try to keep my own movements as unobtrusive as possible. 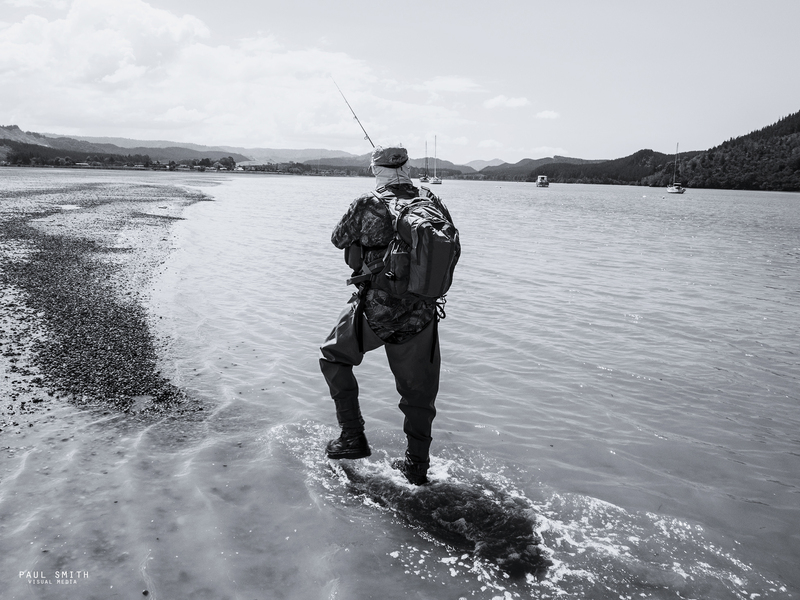 Checking for fish movement, especially in the shallow margins, is an obvious thing to do. Consciously taking time out to calmly look around avoids the likelihood of charging in and scaring away anything that is prowling about hunting for food. You’ll be surprised how often I’ve seen big snapper and kingfish cruising slowly past fossicking opportunistically on the bottom. Something that is equally important though, and often ignored, is to observe what the bird life in the area is doing. In the northern estuaries there are four birds that I primarily look out for namely shags, Royal spoonbills, white faced herons and gannets. Caspian and Fairy terns would feature on the list but they are less commonly encountered. 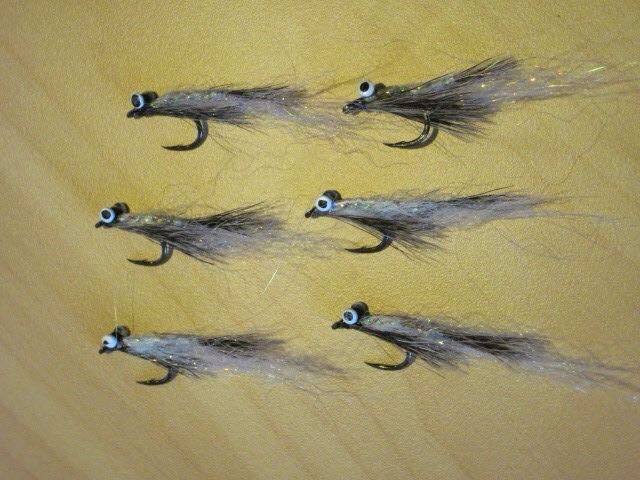 Shags of all types are a reliable indicator of the location of bait fish schools. They will regularly congregate on the water to hunt in concert and when you see this it is worth getting near them as often this activity is the precursor of a kahawai attack. I have also noticed that when they have finished fishing shags will retire to the immediately adjacent shore to dry their wings. 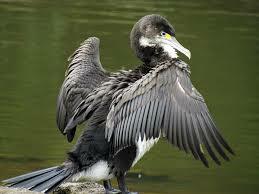 If an angler comes across a shag sitting on the shore with its wings outstretched then it is definitely worth having a few casts in the general area as larger predatory fish may also still be present. Tidal flats hold a bounty of food for wading birds so they consequently gather there in large numbers to feed. Mud probers like oystercatchers and godwits push their beaks deep into the sediments in search of shellfish, marine worms and insect larvae. Wrybills feed from the surface of the mud, sweeping their beaks across it in search of insects, small crabs and prawns. Pied stilts search the water and marshy rushlands for aquatic insects, snails and crabs. Others such as White faced herons and Caspian terns are fishers, stalking the estuary waters in search of their swimming prey. However, of all of these Royal spoonbills and White faced herons seem to be the most reliable indicators of likely fish activity. When I was fishing in July – August on the Manukau harbour about six years ago I discovered that there is a relationship between Royal spoonbills and mantis shrimps. 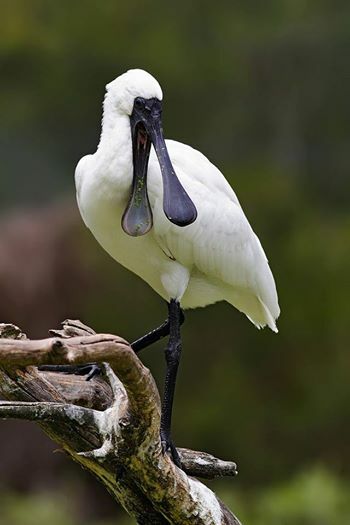 For about six weeks the Royal spoonbills inhabited the area where I was fishing and I thoroughly enjoyed watching them systematically scything the margins with their beaks catching mantis shrimps. It was a majestic sight to see upwards of 40 birds working in tandem to mine the shallows near the sand banks, lit up like incandescent bulbs in the sunlight. There were so many shrimps present that I regularly foul hooked them when retrieving a bibless lure and I’m picking that they were impaled whenever I ripped the lure through the water. The kahawai were also zoned into this bounty and regularly exploded into the shallows, especially in the half-light around dawn, preying on mantis. Once I twigged to this I started to use imitation shrimp soft plastics on a 7 – 14 gram jig head and the results were impressive. In one memorable 1.5 hour session I hooked 8 kahawai between 2 – 3 kilograms, landing only 5 of them. It was epic stuff. For two months I could do no wrong and then without warning the Royal spoonbills disappeared and the fishing again became patchy. Well recently the Royal spoonbills were back and I fluked a kahawai that had a native snapping shrimp in its gut. I then realised that the reason for the Royal visit was once again mantis shrimp. Armed with this knowledge I returned the following weekend and managed to land a 2.5 kilogram trevally on a “Brush Ranger” fly, which is coincidentally my favourite shrimp imitation. If you live in Auckland, fish on the Manukau and see Royal spoonbills working in your favourite bay then put on a shrimp imitation and fish the shallows. These birds are not there to work on their tans. 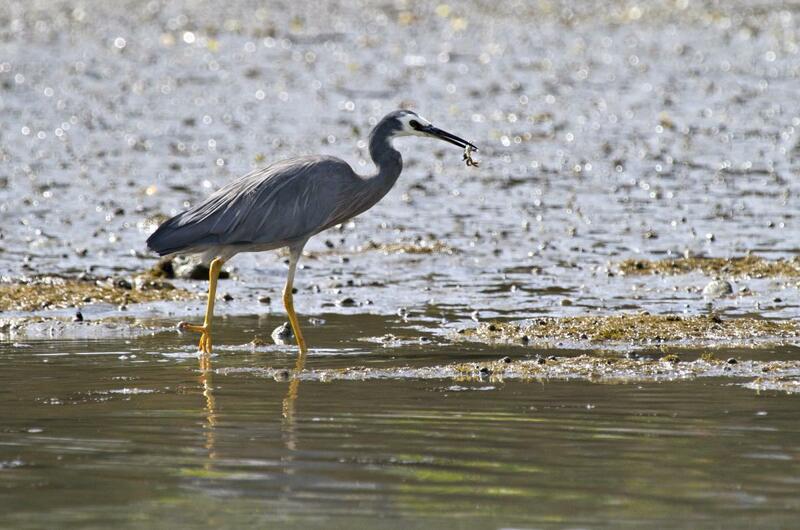 The white-faced heron is New Zealand’s most common heron. It is a tall, elegant, blue-grey bird that can be seen stalking its prey in almost any aquatic habitat. Because it occupies space also shared with people it is usually well habituated to their presence, and may sometimes allow close approach. The white-faced heron is a medium-sized heron with primarily blue-grey plumage. As the name suggests adult birds have white on their faces and the front of the neck. The back is medium blue-grey with the chest and underside more brown-toned. The dagger-like bill is dark grey, dull yellow at the base, and the legs are pale yellow. Foraging white-faced herons walk slowly with long, controlled steps, watching for any signs of prey, which is grabbed with lightning speed. They catch and consume a wide range of prey, including small fish, crabs, worms, insects, spiders, mice, lizards, tadpoles and frogs. It is when they seem to be feeding on small fish that I take notice. If they are feeding quickly and successfully then something big is driving the small fish into the margins and often it is kahawai. Get close and fire a cast or two in the general area. 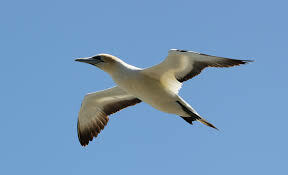 Gannets also enter estuaries primarily to hunt bait fish and are useful indicators of bait school location and channel depth. The angle at which gannets enter the water, and the height from which they start to dive, can tell the angler a lot about the depth at which fish schools are holding. If the gannet plummets vertically into the water from on high then the fish are holding well below the surface. The higher in the air the gannet commences its dive, the deeper the fish school. Conversely low dive heights and less perpendicular dive paths signify that the bait school is not far from the surface and the water is not deep. Gannets regularly take advantage of bait fish that are being corralled by predators so it is worth checking out any area where they are diving. 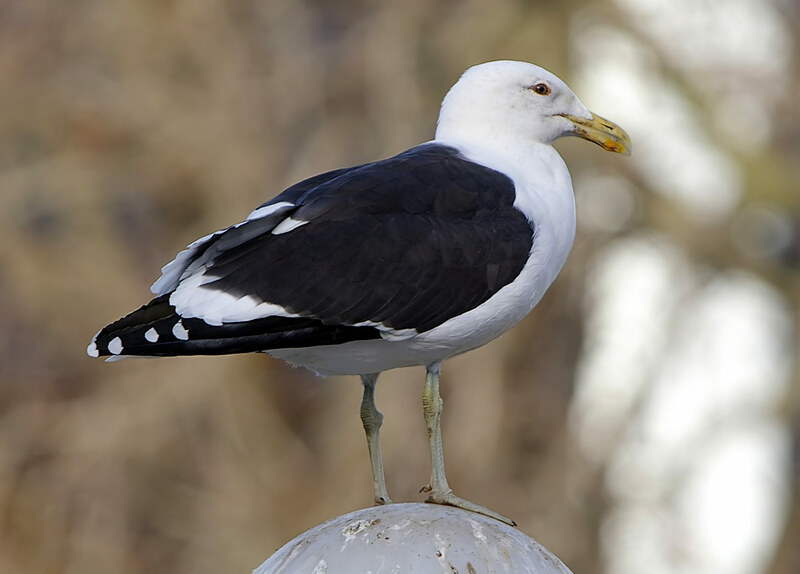 The same cannot be always said of opportunistic scavengers, such as black backed seagulls, as they are more likely to have congregated to consume a decaying fish carcass than be actively feeding on a bait school that is being harassed from below the surface by higher order predators. So in conclusion, start to become more aware of the bird life in the area you fish as their actions can tell you a lot about where the predatory fish are holding and what they are feeding on.